"Nevermore". 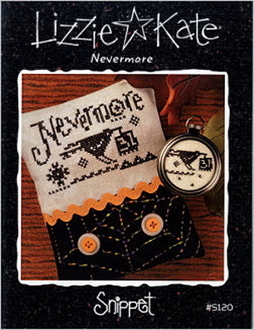 This little Halloween project is a snap to stitch because it's all in one color...black, of course! Design size: 3.5" x 2.25" Stitch Count 37W x 19H. Instructions given for Weeks Dye Works Onyx or DMC Black 310 (not included). Model stitched on 25 count Creeam Dublin Linen, 1 over 1, (not included).